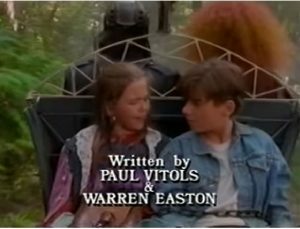 Summer 1989: The CBC had expressed its interest in developing the half-hour kids’-adventure series that Warren Easton and I had proposed called The Jellybean Odyssey about an 11-year-old boy who enters a coma to discover himself in a new world populated only by other kids. I worked out the terms of a contract with Michael Chechik, our producer. In the first place, the network wanted to see some descriptive material (the basis of a “bible”, the detailed description of the concept, characters, situation, structure, and other “rules” for a TV series used by writers to guide their work), a pilot script, and ideas for 12 more episodes to make up a first season, the first few of which were to be developed in more detail than the rest. Fantastic! Delighted! To get going on it, we’d have to get Warren back down from firefighting in the Yukon. Plus I was to be married to Kimmie (in our own house) on 26 August. So we probably didn’t really get going until September. And now that I was “really” in show business, I couldn’t be developing my own TV show as a moonlighting effort, so once again I quit my day-job at ICBC. Warren and I would work at my house, which was otherwise empty during the day. The writing would be supervised by Hart Hanson, a young writer (our age) who was on staff with CBC Drama in Vancouver. The development as a whole would be supervised by David Pears, a CBC executive newly reassigned from Toronto and an old associate of my father’s. I’m sure there were meeting in which Warren and I were asked to describe our “vision” of the show and where we saw it going. Warren and I, who were both “idea” men, were pleased to provide whatever we could in this vein. We got to work. Our concept was wide-open: a fantasy world in which we could make anything happen that we wanted. What did we want? What kinds of adventures should our guy have? How would he set about the task of getting home? What would the kids be doing that he encounters in this strange place? What would be happening to the kid’s, well, body in the waking world where people would presumably be treating him for his coma? We tussled with these questions and many others. We quickly realized that we couldn’t simply have our guy wandering aimlessly in search of his home, knocking on doors in this strange new world. He would need to have a sense of destination, of quest. What could we have him heading toward? In stages we came to see that the notion of a goal for our hero could also provide structure to our imaginary world. We imagined that our guy’s father had died when he was younger, and that this father–named Brad–was now, in his teenage form, revered as the leader of this place inhabited only by kids. Yes! Brad could live at some remote and hard-to-reach spot–The Tower–and our guy would journey toward this powerful and mysterious figure (unaware that it was his father) to see whether Brad could help him return home. We were excited by these ideas, for they gave our show a mission, a purpose. It would provide a skeleton along which to arrange the adventures of our epic quest. Warren and I were conscious of, and excited by, the mythological potential of our story. We thought we might model our quest on that of Jason and the Argonauts for the Golden Fleece, with our plucky heroes arriving at some new hair-raising problem in each episode. We even made our hero’s name Jason. (In our scribbled notes we always abbreviated his name as “J”, and soon started calling him J for short. Eventually we figured that we might as well just call the character Jay and have done with it.) I bought a copy of Robert Graves’s telling of The Golden Fleece, and we also got other sources of possible story ideas, such as the collection of Grimm’s Fairy Tales. We had to come up with 13 great story ideas. At the same time we studied comas and the therapies used for them. We made trips to the UBC library and even took a trip to Seattle to visit a state-of-the-art coma-therapy facility there. (The staff were very helpful, even excited at having these “TV people” arrive to study them–and even providing us with an excellent boxed lunch from Nordstrom’s.) We wanted to make our “upworld” (we developed the terminology of “upworld” and “downworld” to refer respectively to the waking world and fantasy world of our story–terminology that we would use in the scripts to denote where each scene was taking place) as realistic as possible. We wanted to give a sense of the trauma of coma and the eerie, long path back. Our ideas were greeted mainly with enthusiasm. The real test though would be in the pilot script: that’s what would show what kind of a project this was. Warren and I, although we of course recognized the necessity for working out how the show was going to work and what it would look like, didn’t like writing the “marketing” material and wanted to get on to scriptwriting. And soon enough it was indeed time to knuckle down and write our pilot script. It was fall 1989, and we set out to draft the “origin episode” for The Jellybean Odyssey. This entry was posted in the odyssey and tagged canadian broadcasting corporation, david pears, grimm's fairy tales, hart hanson, mad max, michael chechik, Paul's house, Paul's life, pilot script, Robert Graves, ryan reynolds, scriptwriting, stand by me, star trek, the golden fleece, the jellybean odyssey, the odyssey odyssey, The Wizard of Oz, UBC library, warren easton, writing for tv. Bookmark the permalink.